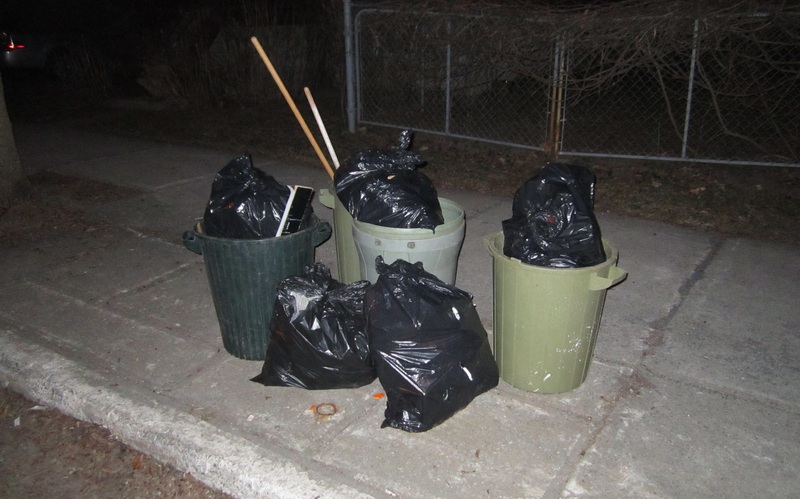 I had planned on going to Ville St Laurent this past Sunday for their heavy garbage day, but the cold weather as well as some general fatigue reduced my motivation to travel very far. I wanted to get out of the house regardless, partly because there’s some great radio shows to listen to on Sunday nights (“This American Life” at 11pm, and “The Sunday Edition” at midnight), so I did a run a little closer to home, covering neighbourhoods I don’t usually go to. 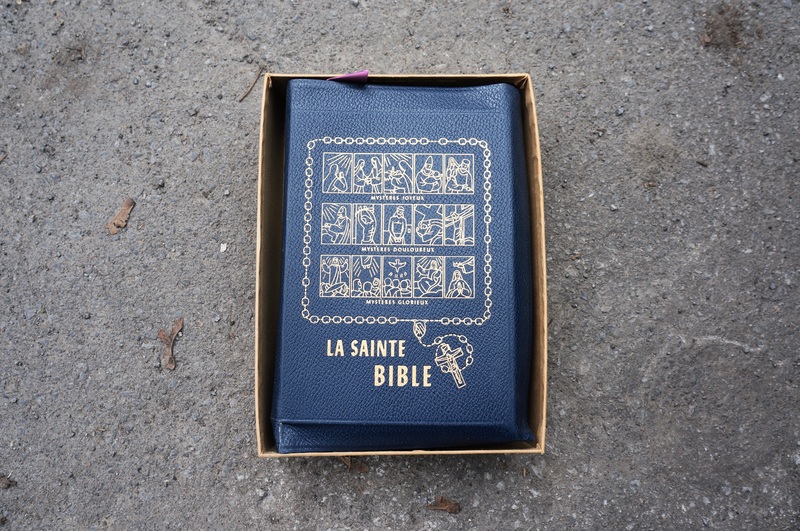 This pile was in Saint-Michel, one of Montreal’s more diverse neighbourhoods. I haven’t explored it enough to say much else, though most of the buildings I’ve seen there look to have been built between the 50s and 70s. There was lots of sewing related stuff inside the bags, mostly old fabrics and scraps that didn’t look special enough to bother with. 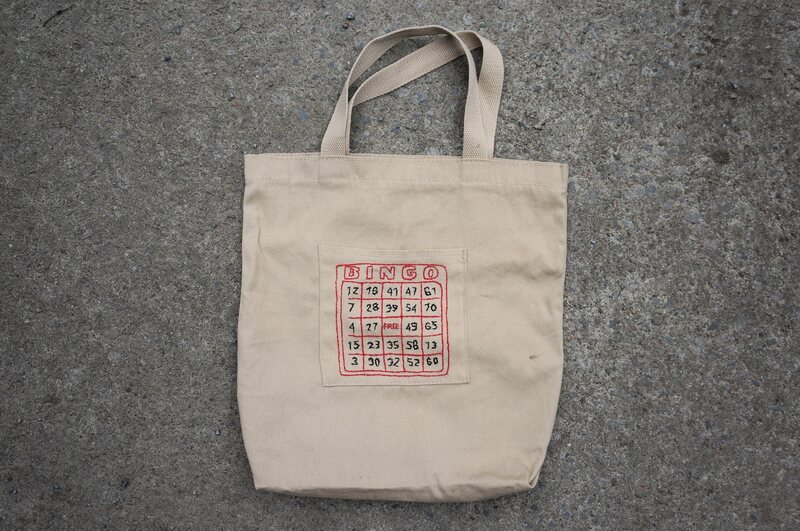 … and a bag stuffed with buttons. 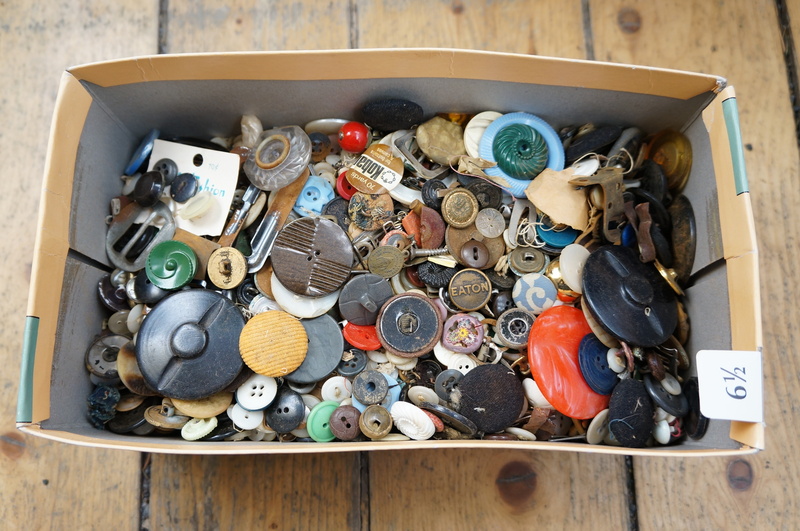 I like looking through these collections because oftentimes other small items will end up in with the buttons. Also, sometimes the buttons themselves can be pretty cool. 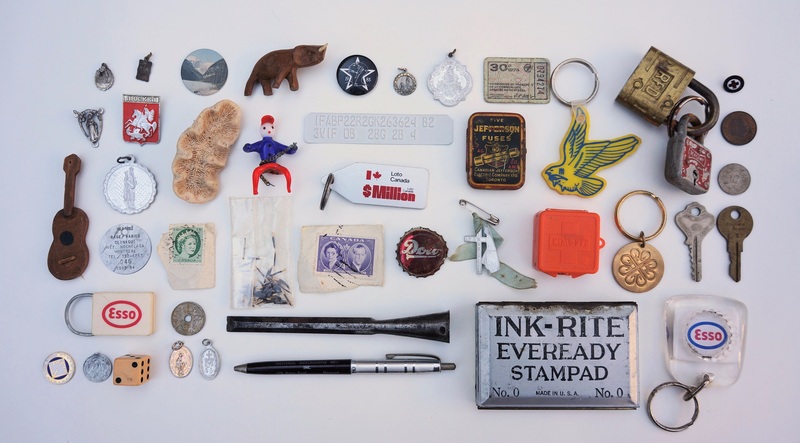 I emptied the bag into a shoebox, and sorted out the pieces I found most interesting. 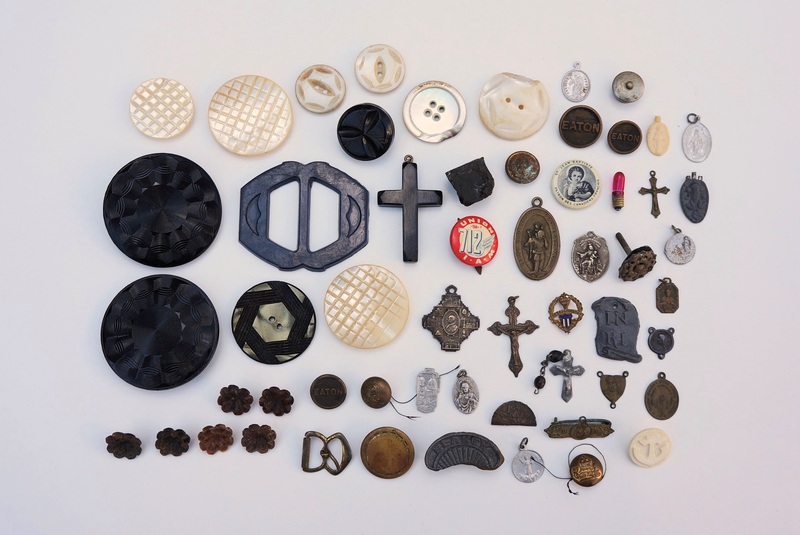 Several Catholic pieces emerged from the buttons, including a nice Pope Pius XII cross and a vintage St Christopher medallion. The chunky crucifix near the middle top gives off the now familiar smell of bakelite, as does the belt buckle next to it. The bakelite crucifix might be worth listing on eBay. 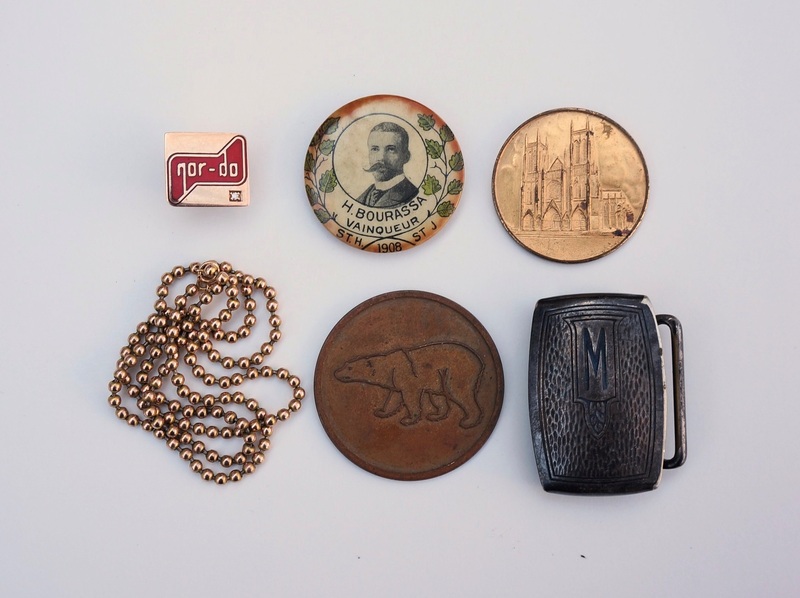 Otherwise, there were several buttons that look to be made of mother of pearl, a few vintage metal buttons likely from Canadian military jackets, and several buttons that are either amber or faux amber (bottom left). Most of this will end up in my yard sale “junk box.” The rest of the buttons I’ll likely leave on the curb for another scavenger to find. 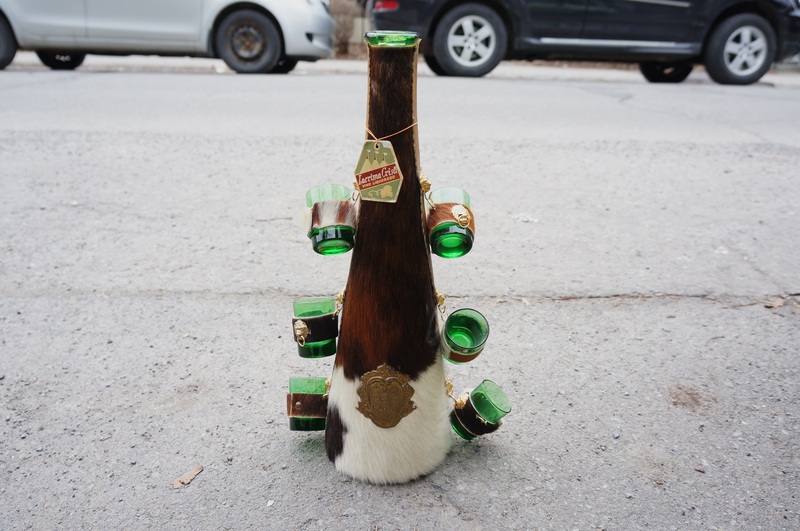 Otherwise, I returned to a place in Ahuntsic that provided some interesting finds about a month ago. I had given up on the spot after striking out there in three successive garbage runs, and was genuinely surprised to this accumulation of bags on the curb. Again, the bags (at least a few of them) held a lot of small items. This time around though the quality of the items was generally better, with less rusty or ruined crap to filter out. Still, there was a lot to sort through; I spent a good hour or so out there on the curb, missing the entirety of “This American Life.” Oh well. I hope you like the small stuff, because there’s a bunch of it coming up! The bag on the right holds a whole bunch of old Catholic charms. There were a few more vintage rulers, as well as some kind of food-related tool from Montreal’s once popular Kon Tiki restaurant. There’s a tooth (I think fake, but I’m not sure) to the right of the pen, which looks to contain a bit of gold. There’s plenty of other stuff too, but I’ll leave you to look at it as you please! On a side note, the camera I bought recently (a Sony Nex-5N) is much better at these sorts of group shots. These photos are a lot more crisp than the ones I would have been able to take with my other camera. The items that stick out most to me here are the old chisel bit, the bus ticket from 1974, the Loto Canada keychain (proudly stating a figure that is now nothing to write home about), the orange box (which contained some apparently unused vintage earplugs), the bag filled with what looks to be porcupine quills, and the cross pin to the right of the Dow bottle cap, which commemorates the 100th anniversary of the Lourdes Apparitions. These items were the “cream of the crop,” or at least interesting enough to add to this last photo. On the right are two gold pieces, one a pin probably given to an employee by a small company somewhere, the other a 10k gold ball chain by Birks. I was surprised to see a gold mark on that piece, as I’ve never seen a chain of that style made of any precious metal before. Together they weigh 9.79g, making their gold scrap value about 200$. On the right is a “souvenir of pilgrimage” from the St John’s the Divine Cathedral in New York. Below it is an old Hickok silver plate belt buckle. At center bottom is a medallion oddly marked with just a picture of a bear. On the back is marked “C. 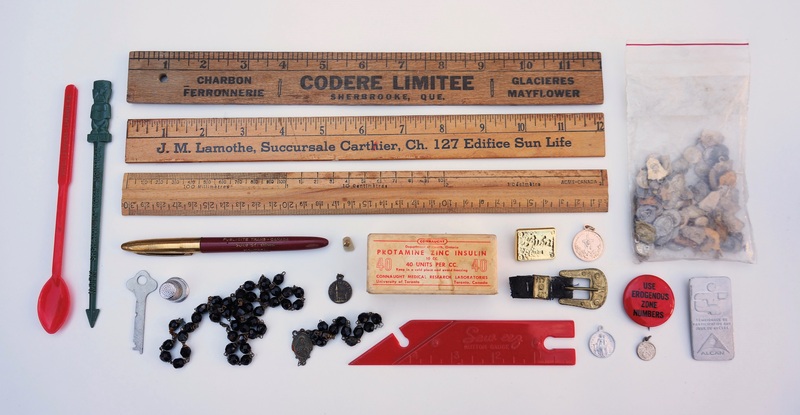 Lamond Montreal,” a company that made a lot of small metal items back in the day. If you have any idea what the bear is meant to represent, let us know in the comments! The coolest piece though is at center top. It’s a pin featuring Henri Bourassa, apparently made in celebration of his wins in the 1908 Quebec Election (“vainqueur” means winner). Bourassa was a prominent politician in Quebec from around the turn of the century to WWII. He’s probably best known for fighting against Canada and Quebec’s involvement in what he considered Britain’s imperial wars, and the use of the draft to force individuals to fight these wars. He was one of the first people to promote Quebec nationalism, though his brand was not at all like the type that now exists. He founded Le Devoir, a Montreal-based french-language newspaper that is still active to this day. In Montreal there is a major road named after him, as well as a metro station and an electoral district. I have an interest in politics, so I enjoyed finding this button for that reason alone. However, it also seems to be a pretty uncommon thing – I’ve had no luck finding anything similar to it online. Vintage political buttons can go for a lot of money on eBay, and I suspect this button will sell for at least 100$ and likely a fair bit more. I’ll definitely be keeping an eye on this spot again over the next few weeks! You might want to sell those vintage buttons on Ebay. I want your buttons! Can you email me with a cost to ship to Kansas? I use them for crafts. Unfortunately because of the weight it would cost about 25$ (Canadian) to ship. I’d also want to add a bit extra for my effort. Email me if you’re interested. What I might end up doing is making an eBay auction, as they do seem to sell well. I’d like to get some more pictures of them regardless, because a lot of them aren’t in particularly good condition. Thank you for checking. Too bad the shipping would be so high. If you were in the U.S. you could fill one of the small priority shipping boxes and not have to pay by weight. But, I don’t think it will work for Canada to U.S. Best of luck on your ebay auction. Your time is valuable! Yeah, you guys are lucky with your priority boxes. Shipping rates are at least twice as expensive here I think. I assume that’s partly because Canada is so huge, and there are many very rural areas that need to be serviced at someone’s expense. I’ll second what Emily said. I’ve made some nice $$ from lots of old buttons in the past. You’re right, they do go for pretty good money! There’s so many things I can sell and so little time, ha ha. However, it seems like buttons lots are easy enough to do. I am glad you did a foraging trip in Ahuntsic.Ahuntsic has hundreds of huge mansions and bungalows,especially in the northern part of the borough.You should do this borough more often,even though it is a mostly French-speaking neighborhood,unlike more diverse Ville St.Laurent.Isn’t it great that you found a Henri Bourassa political button from 1908 in Ahuntsic?It has a lot of value.The heart of Henri Bourassa boulevard is in Ahuntsic ironically. Yes, the Sault-au-Récollet area is very nice in particular. The main issue is the two garbage days a week, and the different recycling day (not all of the time, it seems). I hope they take after Villeray soon, and reduce pickup to once a week. That would make it more worthwhile to go to regularly. I once bought a tin of buttons at a church sale for $4 CDN found a really cool glass one that looked like a fly on a circle in the bunch that I sold for $10 USD. I never pass up buttons if I can get a bunch for a few bucks. I see these collections pretty regularly, especially in working class neighbourhoods. I always take buttons if they look halfway interesting. 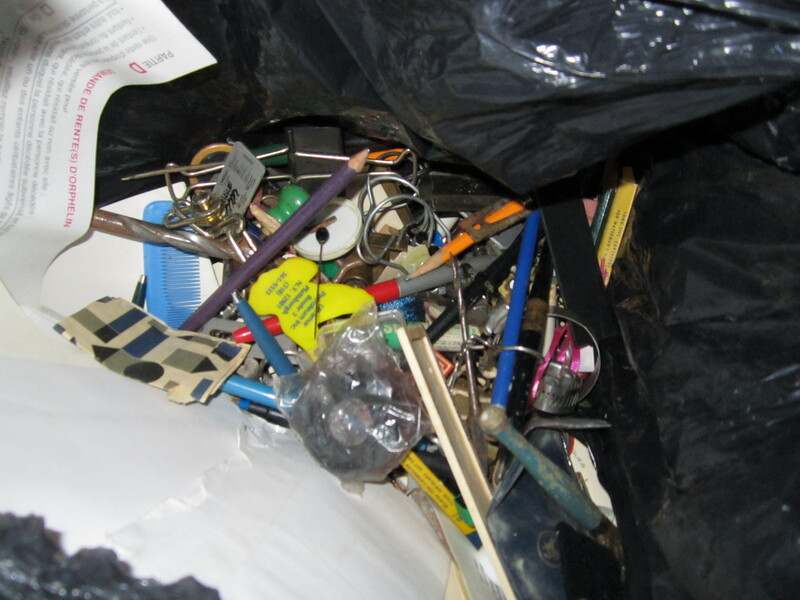 How can people throw out scrap gold in the trash?Hundreds of pieces of scrap gold in black garbage bags must end up going to the garbage dump every year in Montreal.Thanks for your rescues and drawing people’s attention to this issue. I expect the number is in the thousands, perhaps the tens of thousands actually. Some bigger than others, of course. I honestly think that there’s probably tens of millions of dollars of gold and silver in the Montreal dump. And that’s just the scrap value. I’d guess that I’ve saved about 4-5000$ in gold scrap (more when you consider the surplus value of that Omega watch, for example) since I started picking “full-time” back in 2012. That’s just me covering maybe 5% of the city, opening up under 1% of the bags. If someone could find an economical way of mining gold from dumps, they’d become very rich. maybe yours is goat fur? Thanks for the links. I expect this is the kind of thing that would make sense to sell in the States, but not in Canada thanks to our higher shipping costs. I think the person asking 90 Euros is a bit out to lunch as well. An odds and sods week, for sure. That kitchy fur-covered decanter is definitely 1970s vintage. Avon moth-proofer! … how pedestrian. Avon doesn’t carry anything like this humble product anymore. Yours has the lid; this one doesn’t. http://www.ebay.ca/itm/Vintage-Avon-Moth-Proofer-Spray-Can-Tin-Advertising-/291540757443 It dates from 1972. I hope Henri Bourassa makes you a bit of cash. I hope to as well. If I had a massive operation I might list the Avon tins on eBay. As is, I think a yard sale is the best method. I guess so! I think I linked to it in this post, but I’m not entirely sure. Either way, it was about a month ago, so if you scroll down you’ll find it. Glad you liked those earrings by the way… If you see anything else you like, but don’t like the price so much feel free to send me an email. I can be negotiable, especially if something has sat around for a while. Some stuff I might be firmer on, but it doesn’t hurt to ask. 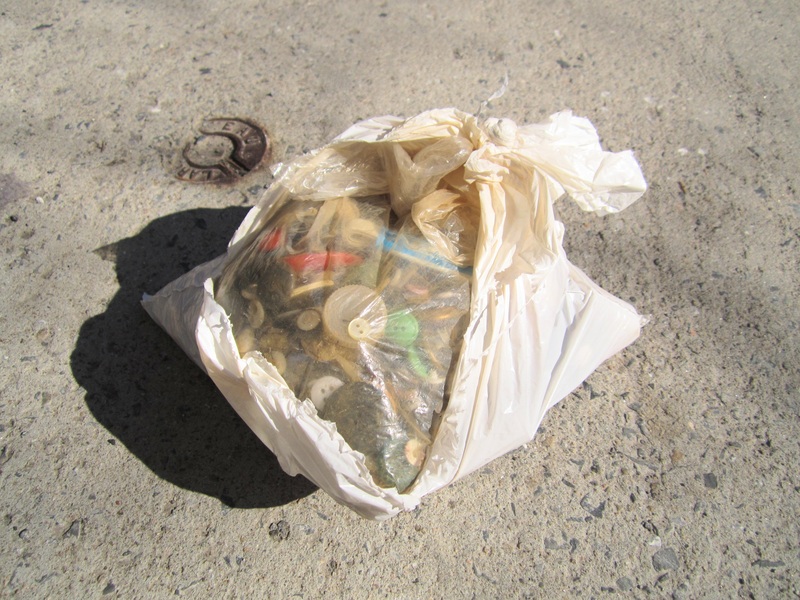 Have you ever sold a “junk drawer lot” of your smalls? I’ve bought and sold a few in years past. There is a market for these little treasures. Not as of yet. I might try it late this year after yard sale season is done. 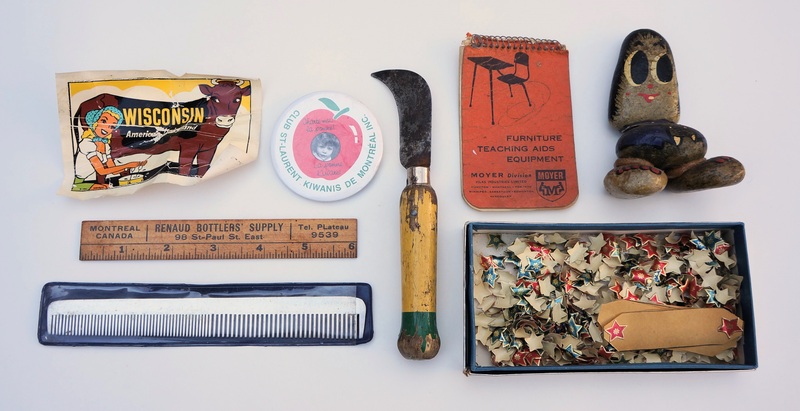 I like to have a “junk box” at my sales – people love looking through the stuff. But when the season is over it would make sense to purge the old stuff.